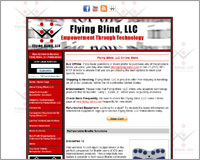 Flying Blind, LLC is pleased to announce the launch of its new online store, specializing in proven adaptive technology solutions that you can trust. Just look for "Store" in our main menu at http://www.flying-blind.com or visit the store directly at http://www.flying-blind.com/store.html. We have several products still under review that may still be added upon approval. We will also be announcing the availability of a section devoted to all of the refurbished equipment sold by Flying Blind, LLC in the weeks to come. All products sold in the Flying Blind, LLC Online Store are products that Flying Blind, LLC's founder, Larry L. Lewis, Jr., either personally uses, or publicly endorses. All Flying Blind, LLC Online Store transactions are encrypted and secure. For additional questions please email store@flying-blind.com. 1) Verizon wireless is making Mobile Accessibility Suite available to their visually impaired customers running at least version 2.2 of Android and who have a data plan. It bundles together ten apps to improve access to the touch screen. 2) Learn about the Accessible Digital TV Radio, VU Indicator and Auditory Oscilloscope Adaptation, available from Oehm electronics, on Tek Talk on GMT Tuesday, 28 August at 00:00. Oehm electronics also repairs vintage Blazie engineering and Telesensory products and entertains ideas for new products. 3) Twitter has produced what is said to be an excellent small business guide for using twitter. This site contains a link to it as well as a simplified version of the guide. 4) NCH Software posts a guest article on its site, touting the fact that its transcription and business point of sale software are all fully accessible to the blind. 5) This VisionAware post, "A Top Eight List of My Favorite Blog Posts by Joe Strechay" offers people researching or coping with vision loss a variety of resources. 6) Ted, which offers "Riveting talks by remarkable people, free to the world. "has compiled a list of its 20 most popular talks. 8) The latest Tech Doctor podcast features Tonya Engst, co-founder of TidBITS (not related to this newsletter,) and editor-in-chief of Take Control Books. 10) From DansTips newsletter we learn about Bleeping Computer, a community based site for novice users to learn the basics about computers and technology. 11) Sendero GPS version 2012.5 for the Braillenote and Sense lines of products now comes with an EZ mode which costs 1/3 of the full price, hence $498.